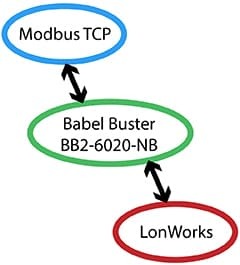 The Babel Buster BB2-6020-NB LonWorks to Modbus TCP gateway is used to connect LonWorks devices to a Modbus TCP Ethernet network without binding or LonWorks network management outside of the gateway’s own capabilities. A large number of data objects gives you flexibility in mapping Modbus TCP registers to scalar or structured LonWorks network variables. Multiple registers may be mapped a single structured LonWorks network variable. Modbus TCP holding registers, input registers, discrete inputs, and coils are supported. 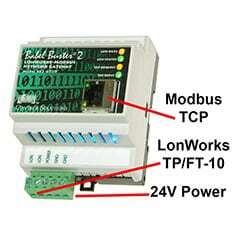 The BB2-6020-NB LonWorks to Modbus TCP gateway will periodically poll LonWorks network variables to read LonWorks data, or write network variables upon change in value (or periodically if chosen). 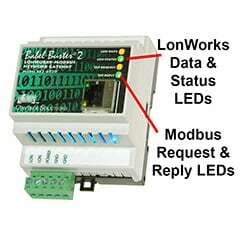 Data read from LonWorks will be placed into Modbus registers. Data written to Modbus registers will be written to LonWorks network variables. 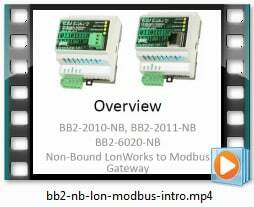 The BB2-6020-NB puts a LonWorks device on a Modbus network. 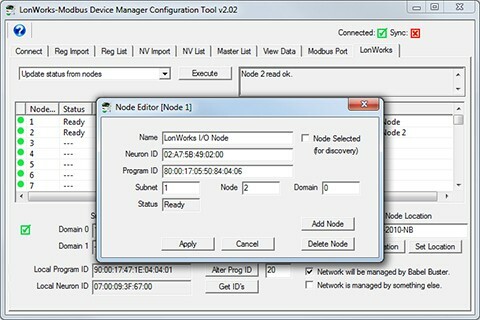 Do you need to put a Modbus device on a LonWorks network instead? If so, you want the BB2-6020 (no -NB). 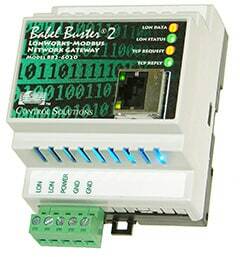 Control Solutions’ Babel Buster BB2-6020-NB is a Modbus TCP client/server used to connect LonWorks devices to a Modbus TCP network without binding or LonWorks network management outside of the gateway’s own capabilities. A large number of data objects gives you flexibility in mapping Modbus registers to scalar or structured LonWorks network variables. Multiple registers may be mapped a single structured LonWorks network variable. Modbus holding registers, input registers, discrete inputs, and coils are supported. 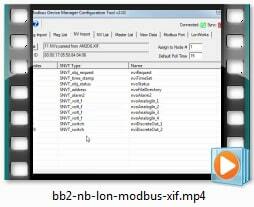 The BB2-6020-NB is most often used as a Modbus server (slave), providing LonWorks data to a Modbus client (master) such as a control system PLC. 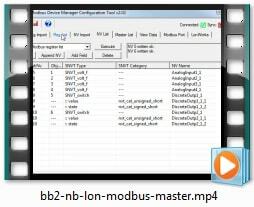 The BB2-6020-NB can also be configured as a Modbus master, automatically reading and writing Modbus registers in other Modbus slaves to share LonWorks data. The BB2-6020-NB provides poll 400 data objects which may be accessed as any of the standard Modbus register types. These 400 registers may be mapped to as many as 300 LonWorks network variables, with multiple Modbus registers often mapped to a single LonWorks network variable. The BB2-6020-NB can poll up to 300 LonWorks network variables, each having up to 31 bytes of data. The BB2-6020-NB provides up to 400 Modbus registers which are used to exchange data with the LonWorks network variables.